Sometime last year I came across an open call for artists to show at our schools local community art centre, Studio 3 Arts in Barking. I knew I wanted to help equip my A Level Photography students with extra skills before they are unleashed into the wider world of their further career paths and university places. That time has come and this evening, after many months of joyous creativity, they shall have their first Private View and first Winter exhibition. Needless to say I am more than impressed with their positive and mature outlook to creativity within a Borough that has been recognized as one of the poorest and least culturally active by the Arts Council. I hope today will be a turning point for all of them who perhaps, like myself at that age, didn’t have the confidence to publicly and proudly show off their creativity in the public sphere. 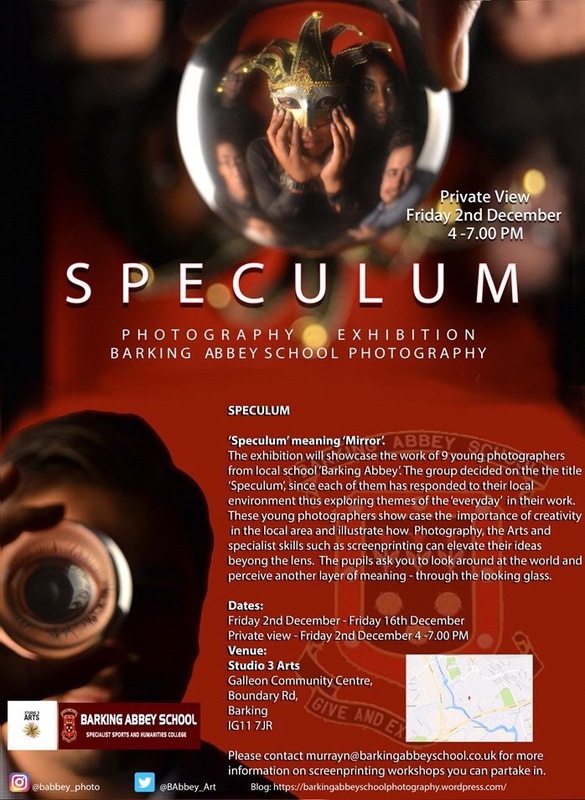 Speculum: A Level Photography Student exhibition at Galleon Community Center, Boundary Rd, Barking IG11 7JR. Studio 3 Arts. So, what can you expect? …vibrant and interesting perspectives to the everyday, beautifully crafted hand made screen prints and work crafted with a sensitivity to the obstacles we must overcome. Artists: Hamzah Mahmud, Kai Fagbayi, Georgia Edwards, Chloe Hartwell, Kotryna Murnikovaite, Aisha, Pinto -Pamben, Isis Smith, Daniel Talveer Sokhal. If you are interested in a collaboration project or interested in screen printing workshops , please do get in touch.